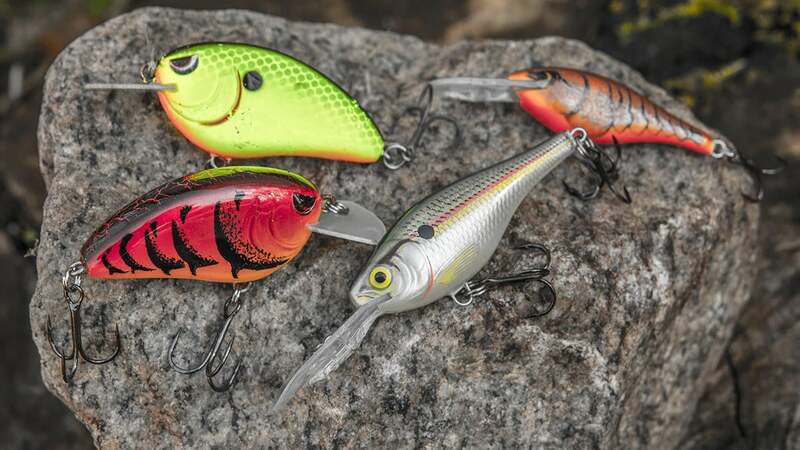 This is a great time of year to catch big bass on crankbaits, but you need to choose the right lure to maximize your success. Although winter tends to scare away some bass anglers, this is actually an excellent time to catch big bass on crankbaits. But it's not as simple as haphazardly choosing a crankbait and expecting instant success. I'm going to explain the three biggest factors I take into consideration when choosing crankbaits for winter bass fishing. Now, this isn't to say that you won't catch a single bass on a traditional round-bodied squarebill. I'm sure you can. But you'll have much more consistent success if you choose a crankbait that has flat sides to it. I say that for one very important reason: Everything underwater right now is moving slower and much more subtly. If you watch underwater footage of shad in the wintertime, you'll notice that they have a much tighter shimmy as they swim. They're not making their usual spastic twitches and sudden direction changes and of course, it's up to anglers to mimic natural behavior as much as possible. I tend to liken it to human behavior. When it's cold outside, are we going to go run around, play in the yard and get a bunch of exercise? Probably not. The shad are the same way. They're flat-out cold and they're not apt to move quickly right now. 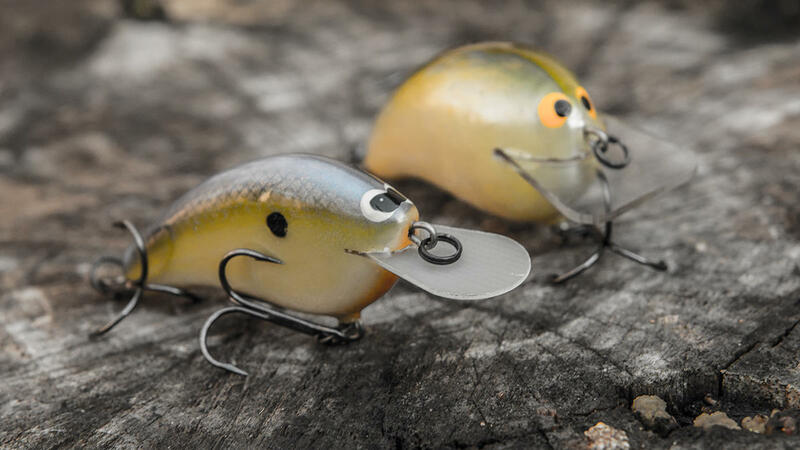 A flat-sided crankbait is one of the best imitators of this lethargic, winter behavior. That's why you hear of so many big bass being caught on Rapala Shad Raps and SPRO Little Johns this time of year. They both have a very subtle, tight wiggle to them and the bass can't help but eat 'em. Takeaway: I prefer to save the rounder squarebills until the water temperature creeps over 60 degrees. If you're fishing in water temperatures in the 42 to 59-degree range, I'd be willing to bet you'll catch more fish with a flat-sided plug. This isn't me just trying to sound like a dork; of course you need sharp hooks. But this is the most important time of year to make absolutely certain they're razor sharp at all times. Spend the extra money and buy several packs of extra treble hooks. If money is an issue, at least sharpen them frequently. Right now, the skin around a bass' mouth is very tough and firm because of the cold water. Pay attention the next time you catch one and you'll see exactly what I'm talking about. When you combine lethargic feeding behavior with this firm mouth, you're flirting with disaster in regards to losing fish. Many times, cold-water bass will swat or roll on top of your crankbait with their mouths closed. If you're using cheap treble hooks, you will miss those fish. 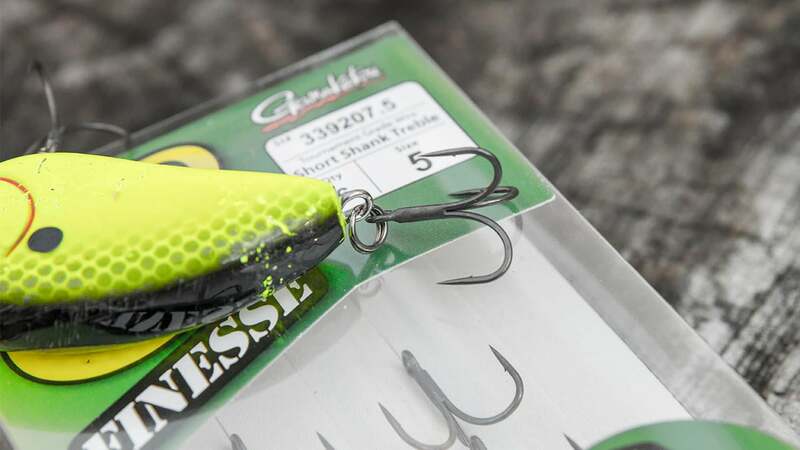 There are two ways I test the sharpness of my crankbait hooks. If the hookpoint won't scratch my thumbnail or catch the skin of my finger without any pressure, I throw it away. 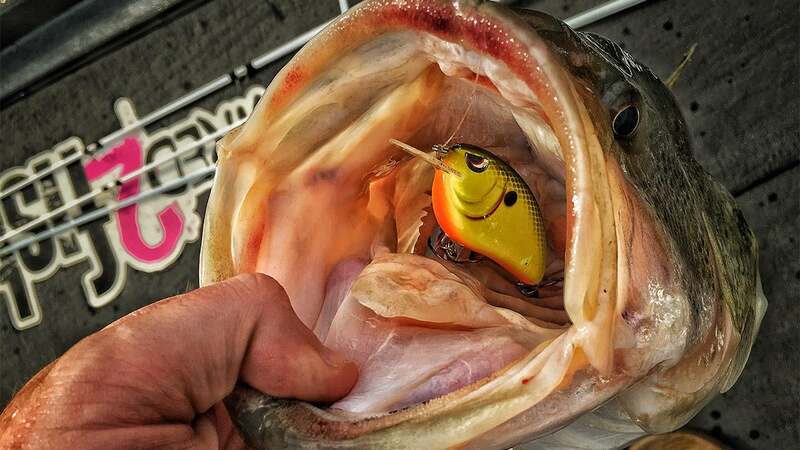 A crankbait hook should scare you to touch. During an eight-hour fishing trip, I'll probably change my treble hooks three or four times in the boat. There's one other thing to consider: You're going to be fishing a lot of rock this time of year. Rocks heat up quickly on sunny days and both the bass and the forage will snug up next to chunk rock, pea gravel and riprap. Rock will dull your hook points quicker than you can blink. Takeaway: Spend the money. Buy extra treble hooks. I most often use a No. 5 Gamakatsu TGW Nano Finesse Treble Hook this time of year. It's not a sales pitch. If a fish breathes on that sucker, it'll get hooked. This is something I've learned the hard way over the years. I used to spend way too much money when I was buying crankbaits. All the colors were a bit overwhelming, so I, just like a lot of us, bought a little of everything. But please hear me when I say this: You do not need to make you color selection complicated. I stick with a red crawfish pattern, chartreuse/black and a muted shad color. That's all I throw. Most of the country gets a lot of rain this time of year, which results in muddy water. When you find yourself in this position, stick with bright colors. Not only are crawfish on the menu for cold-water bass, but that red color is much easier for them to track in off-color water. Chartreuse/black also gives them a much better visual cue to bead in on. If the water is clear in your area, just stick with a basic shad pattern. I tend to stay away from the chrome finishes this time of year because as we discussed earlier, the shad are a very dull color in cold water. If you only have crankbaits with shiny finishes, you can actually sand the shine off of them. I wrote an article explaining the exact process. It's very easy and it makes a big difference. Takeaway: Stick with those three colors. Don't overthink it and quit tying on different colors every ten casts. Keep your plug in the water and those colors will catch a lot of big bass. Try it and you'll quickly become a believer.